Masaaki Kishibe, is an acoustic guitarist from Japan. Masaaki Kishibe was born in Osaka and began studying piano at a young age, eventually picking up the guitar by the time he was 14. 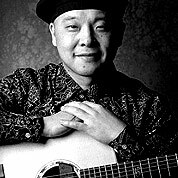 Kishibe learned both instruments at a fast pace and eventually decided he wanted to take learning music more seriously and began composing his own music using the fingerstyle technique.